The 2015 Indian Super League season has finally arrived! 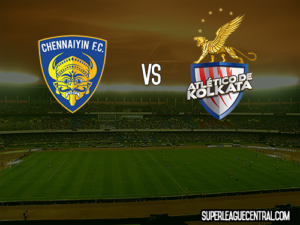 Due to kick-off tonight at 7:00pm tonight, the first match will feature 2015 league title holders Chennaiyin FC against the 2015 champion Atlético de Kolkata at Jawaharlal Nehru Stadium in Chennai. Chennaiyin re-signed six of their 2014 squad members including Balwant Singh, Jayesh Rane, Dhanachandra Singh, Jeje Lalpekhlua, Harmanjot Khabra and Abhishek Das, as well as head coach Marco Materazzi. The Chennai side also signed Brazilian Elano as their 2015 marquee. Nike was announced as the kit manufacturer for the upcoming season. Atlético de Kolkata meanwhile signed Iain Hume from Kerala Blasters, who scored five goals in the previous season to help Kerala to the final of the competition. Head coach Antonio López Habas also signed on goalkeeper Amrinder Singh, defender Augustin Fernandes and Portugese international forward Hélder Postiga as the 2015 marquee. This season sees Nivia replace Umbro as the official squad kit manufacturer.